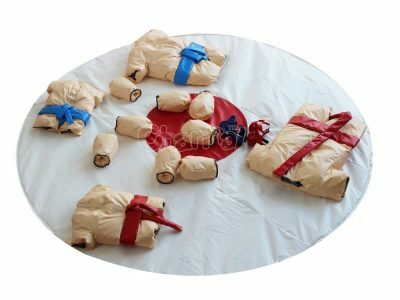 Sumo wrestling suits are foam padded sumo suits for both adults and kids to have fun with funny sumo wrestling game. Those sumo wrestler suits generally also come with padded helmets and mitts. 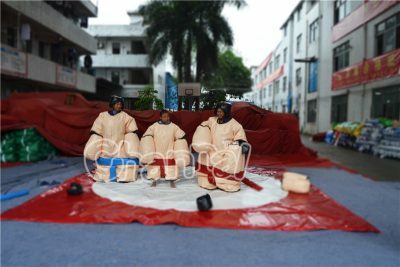 A sumo mat is required for playing sumo wrestling game, but an inflatable sumo wrestling arena / ring can provide more fun and safety. Wrestling game is not the only purpose to purchase this giant funny suit, you are totally allowed to be more creative. Some people wear them to hold a sports and race event, some are enjoying themselves on many inflatable games like obstacle course and meltdown wipeout. 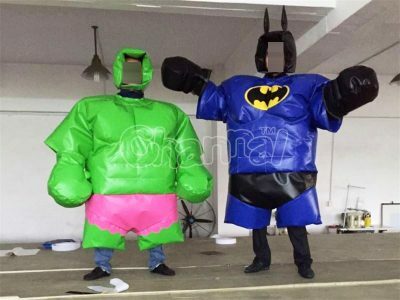 Channal Inflatables is a professional sumo wrestling suits manufacturer in China, you can buy sumo wrestling suits with mat here at a fairly cheap price. Contact us for customizing your own styles, even like changing from sumo suit to superheros’ outfit. 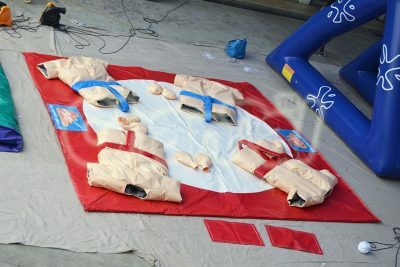 We also manufacture inflatable sumo suits for parties and holidays.